Very attractive and eye-catching temple made of Brass & Oxodize Brass combination for long lasting durability and richness of brass. Brass & Oxodize Temple are very good looking. Brass & Oxodize handicrafts temple offer a comprehensive range of designs, which is reputed for its elegance, exclusive designs and long durability. Be it temple, decorative items or flower vases, you will find the brassy divinity at its best in every item that we offer in this range. Size: Select Size24" x 15" x 32"
Oxodize, also know as white metal oxidized objects that makes it an elegant art. Articles include Oxodize Temple, Bajoth, Bajoth with Stand, Small Temple & many more. Our exclusive collection of white metal oxidized handcrafted items is matchless in terms of quality and finish. The products in this range exhibit the pious and pure beauty which white metal is famous for. 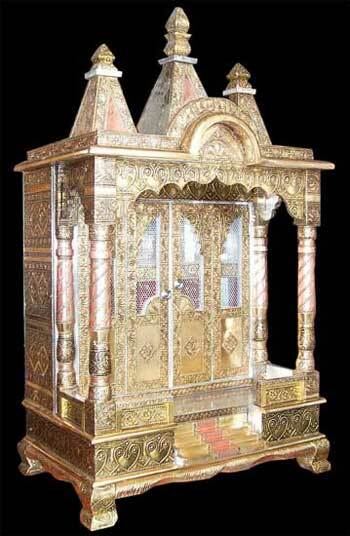 Our hot selling white metal handicraft items include temples, decorative articles, bajot (small sitting table) & many more.